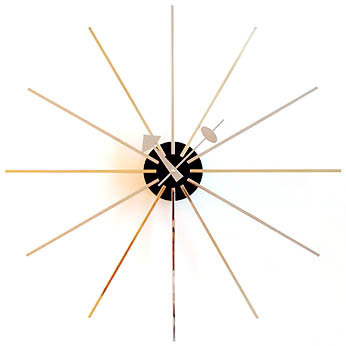 We love this minimal modern wall clock designed by George Nelson in 1955. Made with steel and brass rays, this clock is a very beautiful & functional accent piece. The George Nelson clock collection includes many other modern wall clocks, all designed by George Nelson in the 1950's. Around 1950 the United States was characterized by a firm belief in progress accompanied by a lasting economic boom. Anything seemed possible and everybody wanted to be modern. With a view to bringing modern design right into the American home, George Nelson designed a range of products offering a new an unconventional interpretation of such everyday items as lamps, wall clocks and other domestic accessories. George Nelson's wall clocks typify the spirit of the early 1950's and at the end of the century, are still a refreshing alternative to more traditional (read boring) timepieces.